Vintage Dumont TV Barber's Garage Embossed Metal Sign > Antique Television 9316. We have up for your consideration a vintage Dumont TV Barber's Garage sign. This sign is embossed with beautiful deep color. It is a rare find. It measures 24" x 20" wide. 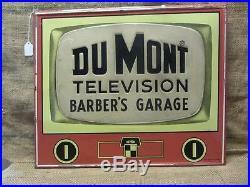 Dumont Television Barber's Garage, Bob Smythe Sign Co, Cedar Rapids Iowa. Good condition with moderate to severe dents, scratches and areas of discoloration and paint chips, see pictures. See description above for further info on the condition. The item "Vintage Dumont TV Barber's Garage Embossed Metal Sign Antique Television 9316" is in sale since Sunday, September 13, 2015.